One of the most iconic Northern Ireland images this last decade has been the Dark Hedges - found just outside Ballymoney in County Antrim. Made famous as the “Kingsroad” in the HBO series Game of Thrones, at NI EXPLORER we’re regularly tagged in Instagram pics from those visiting the location, capturing the trees from their own perspective..
Then, a few weeks ago, we stumbled across the pic above. The excitement grew as, after a bit of research, we found out the Dark Hedges shot was part of something bigger. Riding Thrones, a photography series by internationally acclaimed and two-time Red Bull Illume-winning photographer Lorenz Holder, combines his two favorite things: BMX bikes and Game of Thrones. 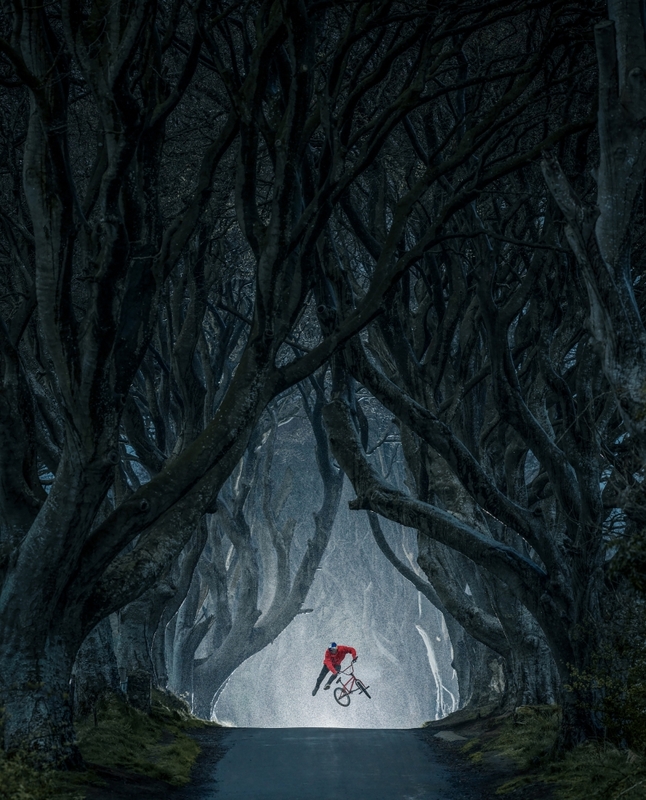 Taking place against some of the series’ most memorable backdrops in Northern Ireland, Holder and his subject Red Bull BMX rider Senad Grosic, create a stark contrast between the real world action of BMX and the fictional world of Game of Thrones’ Westeros. “About three years ago I was watching the first episode of the first season of Game of Thrones. I can still remember how it hit me when I saw that first location – what they call the Haunted Forest. My mind just said ‘WOW.’ The landscapes and the look of the world of Westeros were amazing to see. Partnering with Guild26, f-stop and Holder birthed the latest installment in the Storyteller Series, “Riding Thrones” with Executive Producer & f-stop CMO Jonny Zeller at the helm. “…Riding Thrones is a powerful first step in a movement that hopes to redefine the way creators receive the resources they need…to tell stories they otherwise couldn’t,” said Zeller, of the mission behind the series. Funding for Riding Thrones came with no creative strings attached – simply the charge to create the best content possible in a way that tells a broader story. And to Northern Ireland they came. RECOGNISE THE NORTHERN IRELAND / GOT LOCATIONS? Accompanying the photo series is a video feature showcasing the journey to Northern Ireland and the story behind Riding Thrones, also directed by Zeller. Such a showcase for Northern Ireland. Share this with friends - copy this link https://niexplorer.com/latest/riding-thrones to Facebook/Twitter and share these phenomenal pics of Northern Ireland. …and interesting stories like this? Register for our free newsletter - you’ll get the latest road trip and adventure ideas, giveaways, events news and local promotions straight to your inbox each week. Register here.